A: For most of my adult life, my husband served active duty in the military, so home has been where the Air Force sent us. But, I was born and raised in Minnesota and it has always been home in my heart and where we have now settled down, though I certainly took a circuitous route back here! We have lived in Cheyenne, WY, Spokane, WA, Desenzano del Garda in northern Italy, Las Vegas, NV, Colorado Springs, CO, and Bellbrook, OH, before landing back in Duluth, MN, which is located at the tip of Lake Superior and a mere 150 miles from the Canadian border! A: Troy and I met in college at the University of Minnesota-Duluth, but I knew his brother a few years before I met him, as he was a close friend of my step-brother. Troy and I actually worked together in catering in college (he was my student supervisor for awhile) and one night, after working an event together, he asked me out on a date. We dated for the rest of our time at college and got married the summer that he entered active duty after graduation and so the adventures began! A: I have three fabulous kiddos who are truly my pride and joy! I have 9 year old twin boys, Aren and Ryan. They are the sweetest, most wonderful boys I could ever hope for! Aren is the oldest (by 23 minutes, he’ll have you know!) and he takes on the oldest sibling responsibility role wholeheartedly. He has a tender, generous heart and is very bright. Ryan is my sensitive guy who loves to tell quite involved stories and is currently infatuated with tortoises and turtles! Then, there’s my little red-haired firecracker, Annalise (she likes to go by Anna). She is 6 and is quite the character! She has a sweet, baby face, but is a mischievous, silly, free-spirited, and headstrong little girl. If you’ve seen the Disney movie, Brave, well, in many ways, that’s my Anna! A: When we were living in Ohio, I saw a little girl with a Molly skirt on and it was the sweetest, most original thing I’d seen in kids’ clothes, so I asked the mother what brand it was. 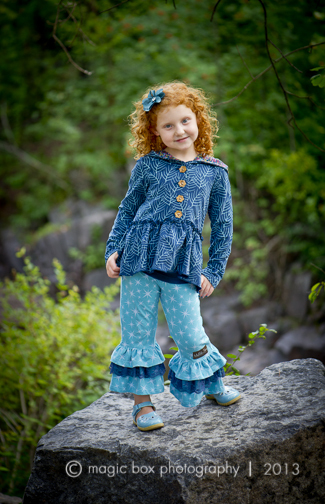 I had not heard of Matilda Jane before, so I went online to find out where I could get these cute clothes. I was put in touch with my local Trunk Keeper, Denee Kochersperger, who invited me to a special photo shoot Matilda Jane party with Picture Fizz Photography. 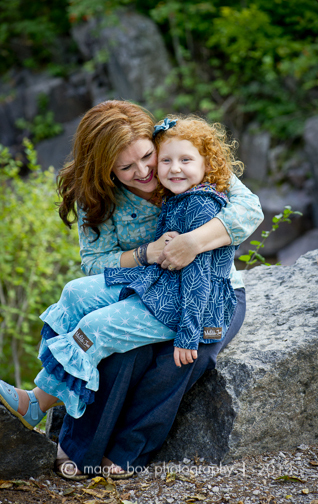 The whimsical clothing captured my daughter’s uniqueness perfectly…and thus began my love for Matilda Jane Clothing! A: All of the women in my family have been significant influences, with perhaps my grandma Ann having the most impact on me. She is an amazing woman! She was the primary breadwinner to a family of 7 kids, who somehow managed to get her Ph.D. while working and raising her very busy household. She has an indomitable spirit and a great joie de vivre. She has spent the last year celebrating her 90th birthday in grand fashion and I can only aspire to live as full a life as she has! A: I’m not a person who likes to have the focus of attention on me – ha! 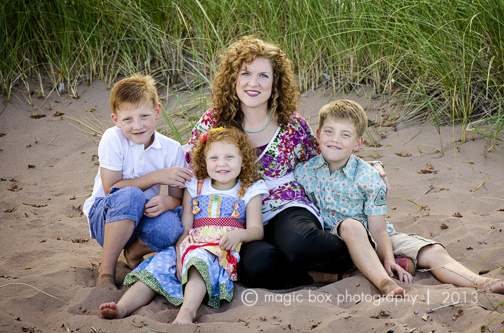 – sort of ironic that I’m being profiled on Matilda Jane’s Candid Keepers! But, they would likely describe me as compassionate, dedicated, thoughtful, independent, and a bit shy. “Minnesota Nice” would sum it up! A: Growing up in a family of environmentalists, protecting and enjoying nature is deeply important to me. Anyone who knows me also knows I have a huge soft spot for animals. Our home is shared with several rescue cats and dogs! I feel compelled to help the creatures that rely on humans to ensure their care and that share their love with us unconditionally. A: Chocolate, for sure!! It can be enjoyed in a variety of flavors, which is much more interesting to me! A: Oh, most definitely a dreamer! A: Well, beyond the obvious, like dreams of world peace and cures for deadly diseases, I would say that I would love to be able to freely travel the world! I’ve had the opportunity to travel a fair amount and have developed wanderlust! A: Oooh, that would be fantastic, wouldn’t it?! There are so many worthy charities or organizations, but I would have to say I would split it between something with a global reach, such as CARE or Save the Children, as well as a charity fighting cancer, since I have had family and friends impacted by this horrible disease. A: I worried I’d get asked this! It is such a tough choice…asking a librarian to choose a favorite book is almost like asking a parent to choose a favorite child! I guess I’d have to say “Under the Tuscan Sun” by Frances Mayes. When I read the vivid descriptions of life in Italy, I was smitten! I was fortunate enough to be able to live a modified, yet still fabulous, version of that scenario when my husband was stationed at an Italian Air Base in northern Italy, where we lived in a bucolic farmhouse just a few years after reading that book! Hello Alyssa from a fellow Minnesotan and redhead!